Pebble has just announced its brand new smartwatch, the Pebble Time, which introduces a fancy new colour e-paper display among a bunch of other features. The watch will boast seven days of battery life, water resistance, a built-in accelerometer, and a choice of three colours that will be exclusively available on Kickstarter. Yes, oddly enough, Pebble's new watch is launching on Kickstarter (again), taking things back to where they started - and it smashed its $500,000 goal in less than half an hour. The big new feature is that colour screen which will be always-on, a feature not available on most modern smartwatches. The e-paper display means battery life is still at an impressive seven days, well ahead of most of the competition. Meanwhile, the inbuilt microphone lets you send voice responses to notification. Pebble says that voice replies work "with most major Android apps including SMS, Hangouts, Gmail, Facebook Messenger, Whatsapp and hundreds more." The Time retains the squareness of the original Pebble, though it's now 20% thinner and sports Gorilla Glass for added protection. However, the OS has had a more significant reworking, organising information chronologically with the new Timeline feature. That should make sifting through information easier than jumping between apps. It is, of course, still compatible with both iOS and Android, one of the biggest strengths of the original Pebble. The watch is also compatible with any standard 22mm watch band, adding another layer of customisation. 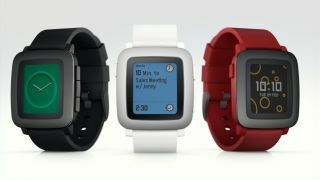 The Pebble Time will on sale for $159 (around £103, AU$204) with shipping to start in May, and will be available more widely later in the year for $199 (around £129, AU$255).